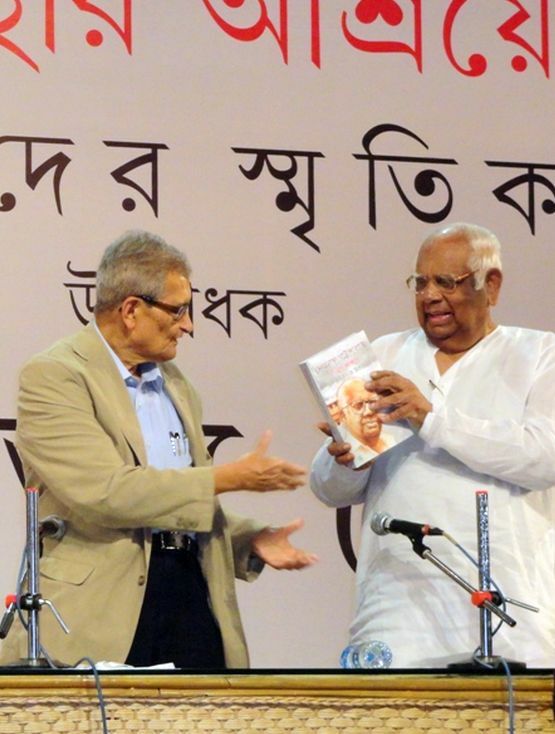 It was a red letter day for the shutterbugs as Nobel Laureate Professor Amartya Sen and former Speaker and Parliamentarian Somnath Chatterjee shared the dais at Rabindranath Tagore Centre (Indian Council for Cultural relations) in Kolkata on a humid Tuesday evening. The occasion was the inauguration of the Bengali version of the book Keeping the Faith: Memoirs of a Parliamentarian penned by Chatterjee and published by Harper Collins. The Bengali title of the book reads Asthar Asroye: Sansoder Smritikotha published by Ananda Publishers. While the book is an account of Chatterjee's illustrious career at the Parliament, the presence of Sen accentuated the book's content. A packed hall listened to Sen recounting his long and endearing association with Chatterjee while the latter just smiled a shy smile. The inauguration of the book by Sen was of great significance, as like Chatterjee, Sen (champion of welfare economics), believes that meaningful development is possible through healthy democratic means. 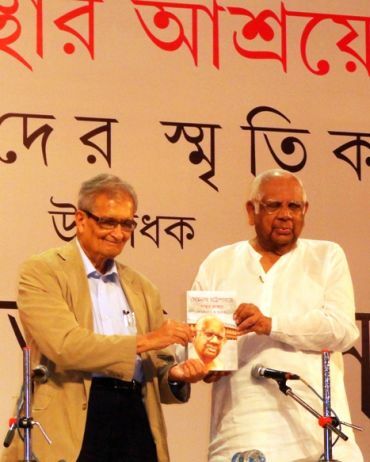 While speaking about the book, whose English version Sen said to have read, the Nobel Laureate lauded Chatterjee for dwelling on the sanctity of a democratic government and voiced his respect for the former Lok Sabha Speaker for standing for his faith throughout his long political tenure. The book, as Chatterjee himself said, is a collection of thoughts, a compilation of his understanding of Indian politics. Modern politics, fraught with violence and distrust hurts the octogenarian and he feels unless each and every problem is dealt with a national outlook, progress of our country is sure to be thwarted. "As a Speaker, I appealed to the members of the Parliament to look upon even a single case of a farmer's suicide as a national issue. But sadly, that was never to be." "Whenever such an incident occurred, the ruling party tried to suppress the event whereas the party in opposition attempted to highlight it to gain political mileage." "India can never be the country of our dreams as long as those in power continue to look at the people as mere vote banks and nothing else," he said. The onus, according to Chatterjee, rests on the younger generation. He gave a clarion call to the youth to join politics and to try and change the system from within. "It does not help being a critic all the time. It's high time we questioned ourselves, 'what have we done for our country'", Chatterjee said. He borrowed from John F Kennedy when he said, "...ask not what your country can do for you, ask what you can do for your country" while Professor Sen nodded indulgently. However, since the book is on Chatterjee's political experience, a particular incident was begging for a mention -- his expulsion from the Communist Party of India-Marxist on July 23, 2008. Chatterjee's eviction came a day after United Progressive Alliance government won the trust vote in Parliament. After the Left parties withdrew support to the UPA government on July 9, Chatterjee let it be known that he was determined to continue as Speaker. Then 79-year-old barrister turned down subtle hints as well as explicit messages from the CPI-M leadership who wanted him to quit the Speaker's post. The party asked him to resign before the two-day special session of the Lok Sabha, which began on July 21. "July 23, 2008, was one of the saddest days of my life. I was shocked, dumfounded. It felt as if I had lost my parents once again," said an emotional Chatterjee. "My four-decade-old relationship with the CPI-M came to an end just like that. I was not given a chance to speak," he added, his eyes almost welling up. The book thereafter documents how false allegations were brought against him after July 23 and how it hurt him. "I came to politics rather involuntarily and tried to do justice to the people who voted for me. But when a handful of them took part in mudslinging, it inflicted pain, a pain that ran real deep," Chatterjee said. 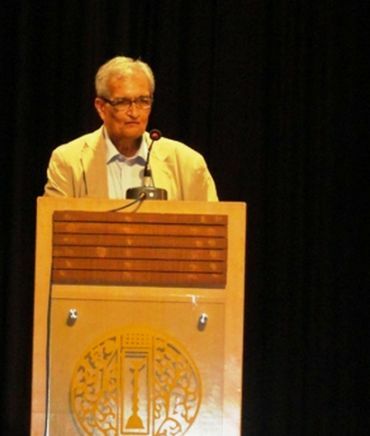 As if in tacit approval, Professor Sen rounded up the evening's discussion with a minor 'complaint' that the book's Bengali name should have had a suffix: Anasthar Sahochorje (meaning a companionship of distrust) thereby taking a dig at the ill-treatment that was meted out to Chatterjee following the trust vote. Chatterjee could not have asked for a better consolation than this. Indeed, it was an evening to cherish.